Lakefront vacation rental - Smith Mountain Lake - Pools - Beach Bernard`s Landing, Franklin County short term rental. Gorgeous 3 bedroom 3 bath condo in Bernard`s Landing with beautiful water views! 1/24: Hook, wine and Sinker view from the deck. This 3 bedroom, 3 bath condo is a must see! Just recently rennovated all bathrooms and kitchen and the entire condo is completely refurnished. There are 2 master King bedrooms with attached baths. The master in the upstairs loft has a trundle bed for the young kids. The 3rd bedroom has two twin beds with a full bath next to it. This unit has high vaulted ceilings and a large open concept floor plan great for entertaining. TV’s in both masters and the family room with Blu-Ray players included. Two decks, one on the main level and a larger one on the upper level, both are set up to enjoy the spectacular views of the mountains, the wide water lake views and are best position to see the 4th of July fireworks!! The master on the main level has a balcony. 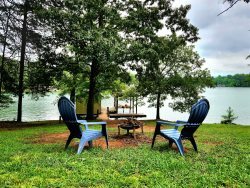 The boat launch is only 200 yards away with the lake and community docks just steps away! Washer/Dryer, cable, and WIFI included. Swimming pools, tennis, beach, fitness center and restaurant all within the community! This condo was in such a gorgeous location, perfect for families with a neighborhood pool and hot tub. Theres an incredible view of the lake, pictures dont do it justice. The condo it self was beautifully decorated and clean. My family and I would definitely stay here again in a heartbeat.